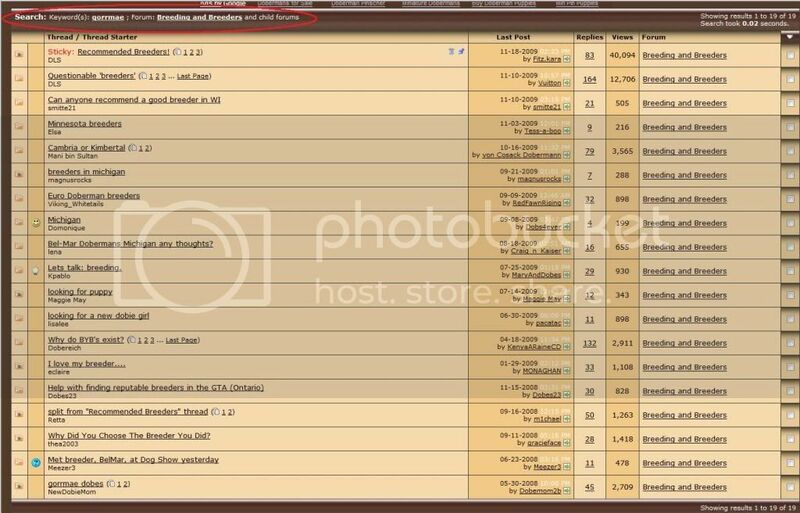 I've put together some tips and screenshots to help people use the forum's search function more effectively. You cannot search for any word that is 3 letters or less. If you try, you will not receive any results. The keyword must be at least 4 letters long. 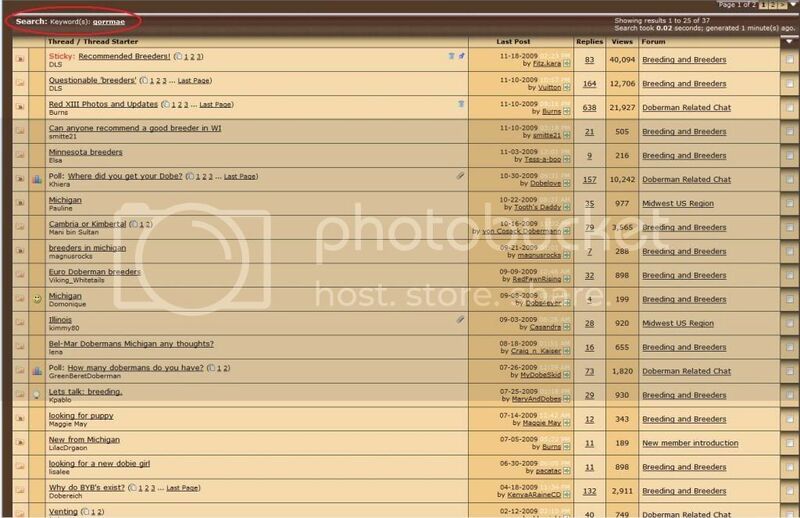 It uses a lot of resources to search a forum and the default is to search for 4 letter or more letters. When you click the "search" link, it will give you a drop down box - ALWAYS select "Advanced Search" (as circled). To yield the best results and to find what you are looking for, always narrow down your search as far as possible using the advanced options, which I will explain below. Here is what you will see what you select the advanced search. Any of these options can be mixed or matched, depending on what you what to find and how you want to view the results. Be as specific as possible. Let's say I'm looking for info on the breeder "Gorrmae Dobermans". I don't want to include the word "dobermans" in my search because that would have a TON of hits on this site and dilute out your results. Therefore, the keyword we want to use would be just "gorrmae". 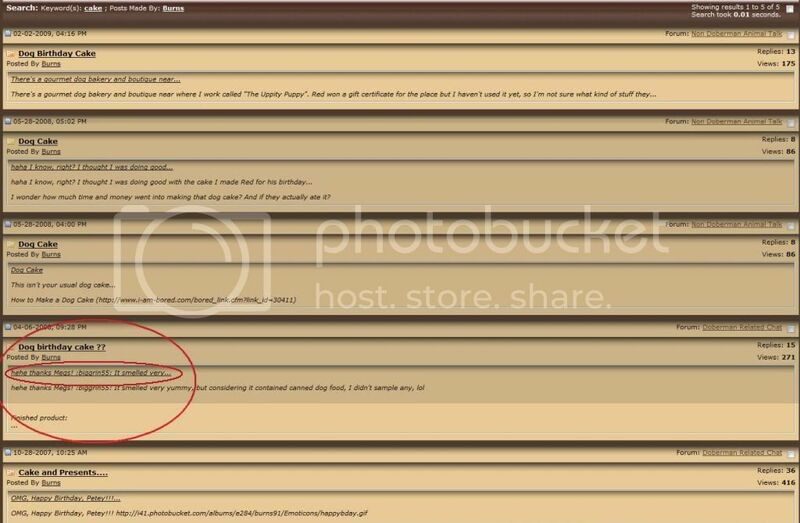 The search returned 37 matches for the keyword "gorrmae" in posts on the entire forum. It returned only 19 matches this time. But we’re still getting some threads that merely mention the breeder’s name, not necessarily a thread ABOUT the breeder. So let’s search for the word “gorrmae” in JUST the titles of threads within the breeder forum this time. 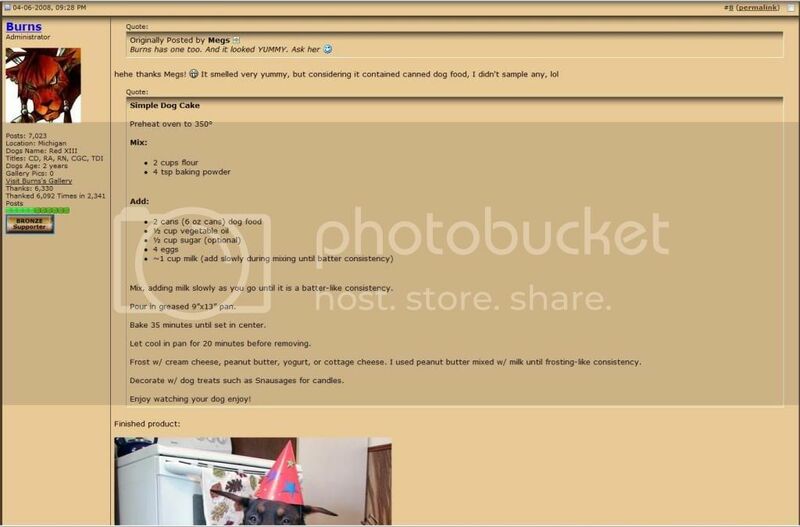 Let’s say I want to view the thread that I posted a birthday cake recipe in, but I can’t remember the name of the thread or which forum it was posted in. So I’m going to put my name “Burns” in the search user field, and the keyword “cake” in the keyword field. And leaving the forum as searching all forums. But changing the search results to show posts instead of threads – so I can see a snippet of the thread so I can tell at first glance if it’s the right one. It returned 30 results, and at first glance, I’m not seeing the post I was looking for. If you have any questions regarding using the search function, please post in the Site Feedback forum. Thank you! Thank you for taking the time to make and post this! To any new folks reading this, please try to do a quick search following Burns's instructions prior to starting a new thread. Thank You.. Have been wondering what the difference is between "Post Quick Reply" and "Go Advanced" ?? "Go Advanced" allows for more formatting options. Thanks Burns for posting this. Can anyone tell me what the"points" are? Have only just found this now, it's a great tutorial, I will definitely post this onto threads for newbies who are feeling a little search function challenged! Thanks for writing it Burns!